The convoy team passed the Cambodian immigration and custom check without so much hassle. But driving on the right is a new thing to us. Driving in Malaysia and Thailand are on the right hand drive means that we are driving on left lane. Because the car is right hand drive, the co pilot play an important role to guide the driver when overtaking other vehicle on Cambodian road. In Cambodian, our first destination is Seam Reap, to have our lunch at the Halal Restaurant called D'Wau Restaurant owned by a Malaysian and after having our lunch at about 3 pm, we planned to visit the famous Angkor Wat. Suddenly, we received an emergency call from our radio and have been informed that one our 4x4 vehicles have a breakdown. Upon checking by the team mechanic we have been informed that the 4x4 had a rear axle shaft fracture. 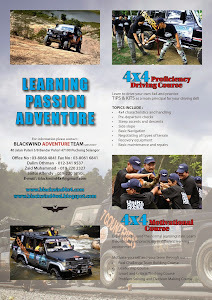 We have to make a quick decision to split the convoy team into 2 team which the 1st team consist of 8 4x4 will proceed with the scheduled which is to visit the Angkor Wat and the 2nd convoy consist of 2 4x4 will be left behind to locate for a workshop and have the car repaired. At the late afternoon, we received a call from our radio and been informed by the team mechanic that the local workshop have no spare parts for the breakdown vehicle and they have to have to order from Phnom Penh or Thailand to repair the car. We decided to let the 2nd team to spend another day waiting the spare part to be despatched and the car to be repaired. Due to the tight schedule,the team have to proceed the trip to Kg Semboa in Cham district which is another 400km and it will take us nearly 10 hour driving. It have become our first night ride on the right lane. We reach at Kg Semboa at approximately 9.00 a.m Cambodian time where the local people have waited for us since 7.00 a.m.